the hand-made tip originally owned by John Minsker, who played English Horn alongside legendary Oboist Marcel Tabuteau in the Philadelphia Orchestra for 18 years between 1936 and 1954. Lickman inherited the original tip from one of Minsker's students, Norman Wells, and used it for 20 years with the Dallas Symphony Orchestra. Lickman's successor in Dallas, David Matthews, has been using it now for over 15 years. to duplicate this same shape. Encouraged by improvements made in measuring and machining technology since that time, Stephen collaborated with Westwind and David Matthews to painstakingly reproduce this shape and deliver a tip much more accurate and durable than the last generation. This tip is now sold directly by David Matthews and is offered with a lifetime warranty. Westwind shaper tips—the best shapes made better. Unlike shaper tips made using traditional machining techniques, Westwind shaper tips use state of the art production techniques to ensure unsurpassed consistency, durability, and symmetry. Westwind tips are made of the highest-grade tool steel and the ears get a special treatment to improve durability. Read comments about this tip. 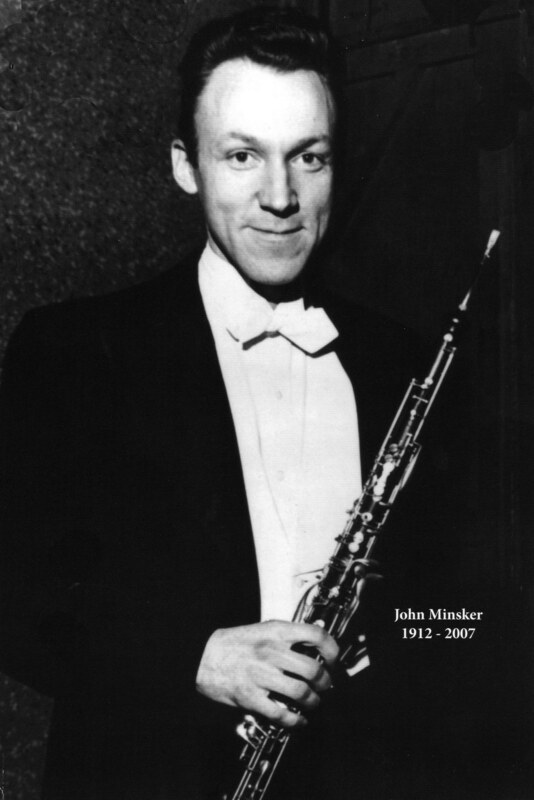 John Minsker was born on January 23, 1912 in Charleston, West Virginia. John Minsker began studying the violin as a pupil of Franz Kneisel and performed in the National High School Orchestra in 1926. In 1929 he began Oboe study with George Crumb, Sr. John entered the Curtis Institute of Music as a student of Marcel Tabuteau in 1931, but left before graduating to play English Horn in the Detroit Symphony in 1934. In 1936 he was named solo English Horn of the Philadelphia Orchestra, Leopold Stokowski, conductor, a position he held with great distinction for 25 years. John held teaching positions at the Philadelphia Musical Academy, the Philadelphia Conservatory, the New School of Music, and was appointed to the Marcel Tabuteau Chair for Woodwind Studies at Curtis, a position he held from 1979 to 1985. Norman Wells was a student of John Minsker and played assistant principal in the Philadelphia Orchestra for one year. He is best known, however, for his longtime career playing Broadway shows in New York City, including A Chorus Line for 17 years. His playing can be heard on the original cast recording of A Chorus Line. Stephen Lickman entered the Juilliard School of Music in 1961, earning two degrees: Bachelor of Music and Master of Science. He studied with both Harold Gomberg and Norman Wells, and performed with the American Symphony, the New York Opera and Ballet Companies, as well as the original Broadway production of Man of La Mancha. He has served as Oboe soloist on recordings and performances of P.D.Q. Bach. Stephen has been on the faculties of West Virginia University, Central Michigan University, Rice University, and Southern Methodist University. In 1975, Stephen joined the Dallas Symphony Orchestra as second Oboe, and two years later was awarded the position of English horn which he played until his retirement in 1995. Stephen is also an entrepreneur and corporate pilot, having owned several companies over the years. These include: the Dallas Bocal Company - maker of the Lickman Bocal, as well as FlightLevel Corporation and Aerographics Aviation - offering everything from professional pilot software to corporate jet sales. David Matthews joined the Dallas Symphony in 1991 and has been solo English horn since 1995. He attended the University of North Texas where he studied with Charles Veazey. While there, he was awarded Outstanding Junior, Outstanding Senior, and named the Presser Scholar. After college he studied oboe and English horn as well as instrument repair with Stephen Lickman. Positions that he held during that time were Principal Oboe in the Dallas Opera and Associate Professor of Oboe at Texas Tech University. He won a temporary position with the Dallas Symphony in 1990 where he played Second Oboe until winning a national audition for Assistant Principal Oboe in the Atlanta Symphony. Since moving to the English horn chair in the Dallas Symphony, highlights have included performing and recording the prominent English horn solo in Shostakovich’s 8th Symphony, performing The Swan of Tuonela and being one of four DSO musicians on the latest Conductor Search Committee that selected Maestro Jaap von Zweden as the current Music Director. David and his wife, Anne, have three children. Having been a big fan of the first copies from the 80's, I've been waiting hopefully for it's resurrection. Made one reed with this new tip and I was convinced. It has changed my life! I really like the new tip. Very easy to make a reed, sits up great with plenty of depth. Just what I've been looking for. Many thanks to Steve, Dave and company!